Here is an elegant meal or appetizer, that takes not more than minutes to whip up. Warm, rich and creamy, it is a great recipe to keep in mind for winter holidays. Serve it with crusty bread for soaking up the outrageously good sauce left behind, or serve the whole thing over pasta for a more substantial dish. Makes four appetizers, or two main courses, or four main courses if served on pasta. Heat butter and oil together in large, lidded, heavy bottomed pot. Add garlic and shallots and saute until fragrant over medium-high heat. Gently add clams and white wine, and cover. Allow the clams to cook in the wine mixture, in the covered pot, until opened, about five minutes. When all, or the majority, of the clams have opened, carefully remove them from the pot with a slotted spoon and cover them to keep warm. Discard any clams that have remained closed. Add the reduced cream to the wine clam broth in the pot, and continue to reduce a bit for a couple of minutes, over medium-low heat, if the sauce feels to thin. Return the clams to the pot and gently mix to evenly cover with the sauce. Sprinkle with fresh parsley and lemon zest. Serve immediately, either with bread or add cooked pasta to the pot and portion out dishes. Catie//Do have a regular email distribution for your recipes??? …. 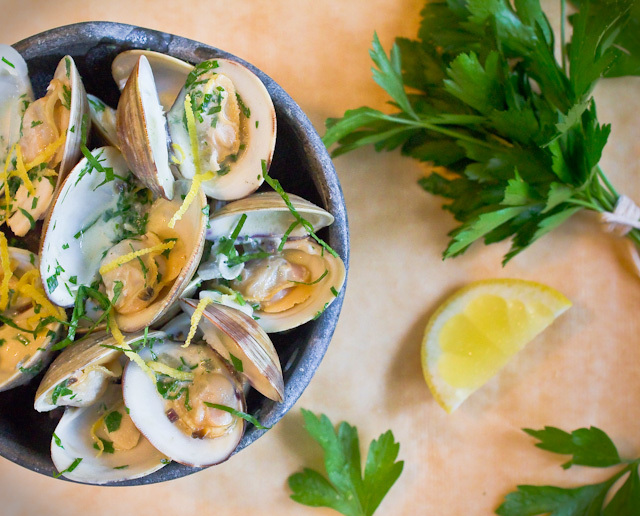 this sounds amazing….. went to the grocer today and he did not have the usual mussels….. so I bought littleneck clams instead!…. I will give this recipe a try tomorrow…. Love the recipe, my 14 year old and I have made it together twice with great success. Today, we added fresh corn with the wine, it brought out a soft sweetness. My daughter’s first gourmet dish… Thanks for the memories.